Tony Mantuano’s artsy Italian cuisine pleases luxe lunch-breakers and Modern Wing patrons alike. 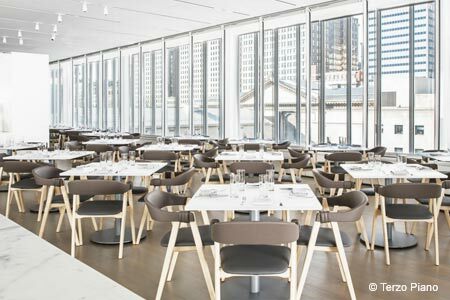 : Sitting pretty in the Modern Wing of the Art Institute of Chicago, this Tony Mantuano restaurant (Spiaggia) can’t even be categorized as museum dining. 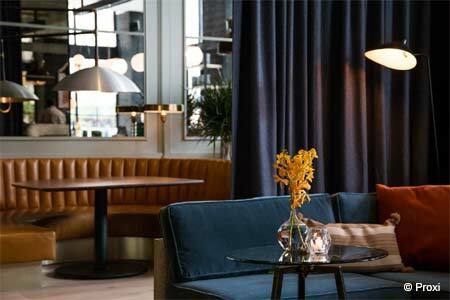 Refined, regardless of its backdrop, the place focuses on lunch made from local, sustainable produce with an Italian spin that earned Mantuano well-deserved fame. Dinner is offered but once weekly (on Thursdays), but the daytime menu leaves no one wanting. Kicky, locally made chorizo dots flatbread with Michigan manchego, tarragon, roasted fennel and onion. Tender, sliced Midwestern beef tagliata tastes ethereal when mingled with grilled squash, aged cow’s milk cheese and cauliflower. Pastas are handmade; the whitefish is crusted with fennel and almond and accompanied by Yukon potato-celery root purée, braised fennel and chive crème fraîche. Cocktails, while creative, aren’t out there, a fact that ladies-who-lunch appreciate; try the Zenzero Rosso made with ginger liqueur, sparkling rosé and grapefruit juice. Mantuano’s wife, Cathy, oversees the wine list, which is smart-but-concise, surprisingly affordable and Italian label-heavy.